Leaving from the car park at Kings Head Beach, this popular 5 km dog and child friendly walk takes in some spectacular coastal views as it transforms from a gravel path to a sealed shared use path winding past Rosetta Head (The Bluff) toward Kent Reserve. The trailhead intersects with the turn off for the Heysen Trail as it turns toward Inman Valley. 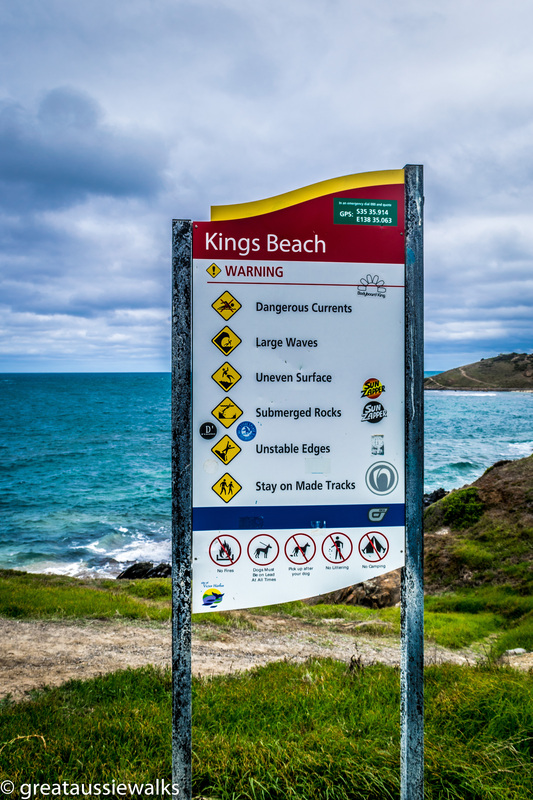 Kings Beach, named after Eli King, an early settler in the Encounter Bay area, is a small beach backed by rocky cliffs facing the Southern Ocean. Although the ocean views may not have changed since Eli and his wife Drucilla settled in the area, the steady stream of walkers and vehicles in the car park, would be in stark contrast from the sight of his horse and cart hauling the stone from the beach to build his new family home in 1858. Across the ocean, the West Island Conservation Park and Aquatic Reserve, proclaimed in 1972 can be seen. Incorporating Seal Island, proclaimed in 1979, the parks are designed to protect the breeding populations of bird species such as little penguins, silver gulls and terns, on both islands. The West Island Aquatic Reserve was proclaimed in 1971 to protect areas used for abalone research in the waters within 100 metres of West Island. 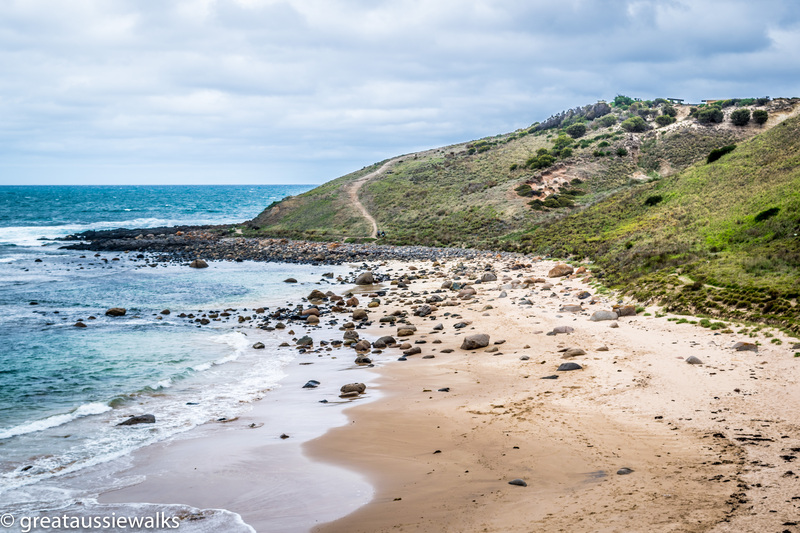 Nestled between Kings Beach and Rosetta Head is the rock-dominated beach of Petrel Cove. A dangerous place to swim due to the presence of jagged rocks and rips, the walking trail affords the opportunity to see dolphins and, in the winter months, whales. 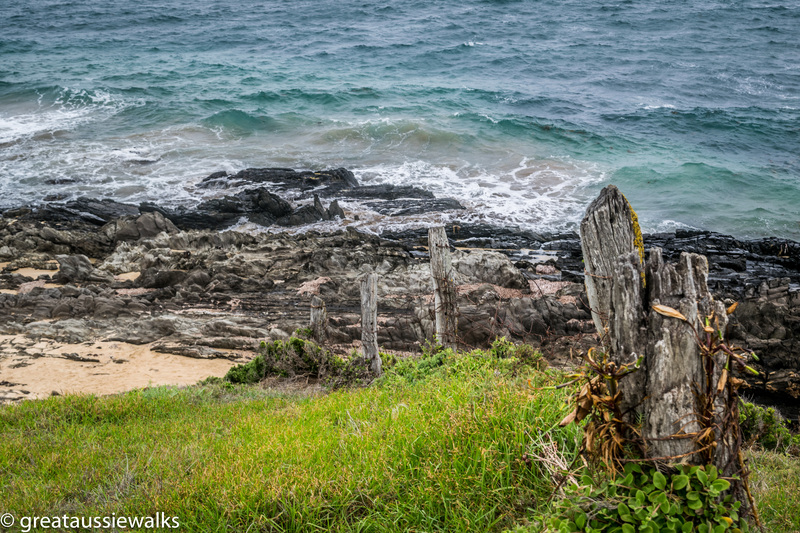 Always in view while walking on this section of the trail, is the dominant granite headland called Rosetta Head, also known as The Bluff or Kongkengguwar by the traditional owners the Ramindjeri. Named after Rosetta French, the wife of George Fife Angus, by the second Governor of South Australia, George Gawler, Rosetta Head was the site of a whaling station from 1837 to the early 1860s. In 1863, a mine site searching for copper, gold, silver and lead was established, before being closed in 1866. A short detour to the spur trail leading to the summit of the granite headland, formed approximately 500 million years ago when magma was pressed from the deep continental crust, provides an additional challenge to walkers. The smooth rounded profile is attributed to the erosive action of a northward moving ice sheet. 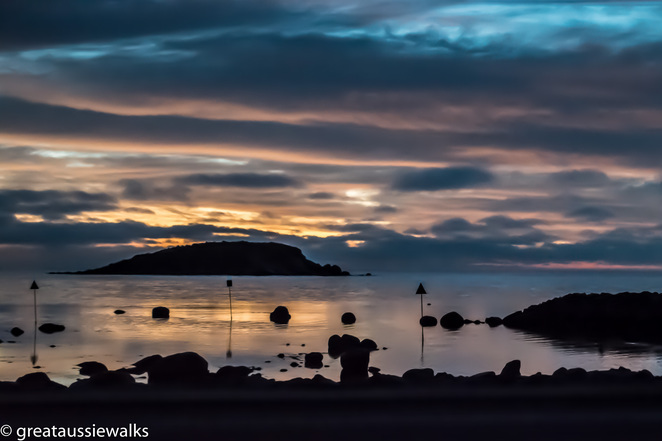 The timeworn 850-metre walking trail to the summit leads to impressive views of Granite Island, Wright Island and Petrel Cove. A plaque commemorating the meeting of explorers Matthew Flinders and Nicholas Baudin in 1802, sits at the summit. Returning to the trail, passing boating enthusiasts launching their craft and fishers casting out a line from the rocks, the sealed shared path along Rosetta Harbor, leads along the coast. 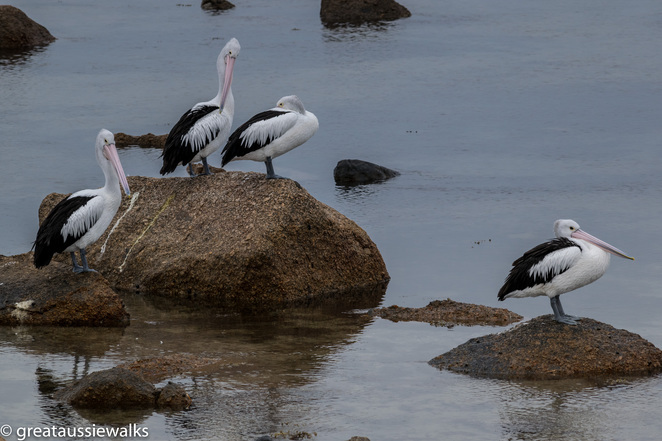 Pelicans sit on the rocks watching people passing by or sleeping with their enormous beaks tucked under one wing while balancing on a rock, quite a balancing act. 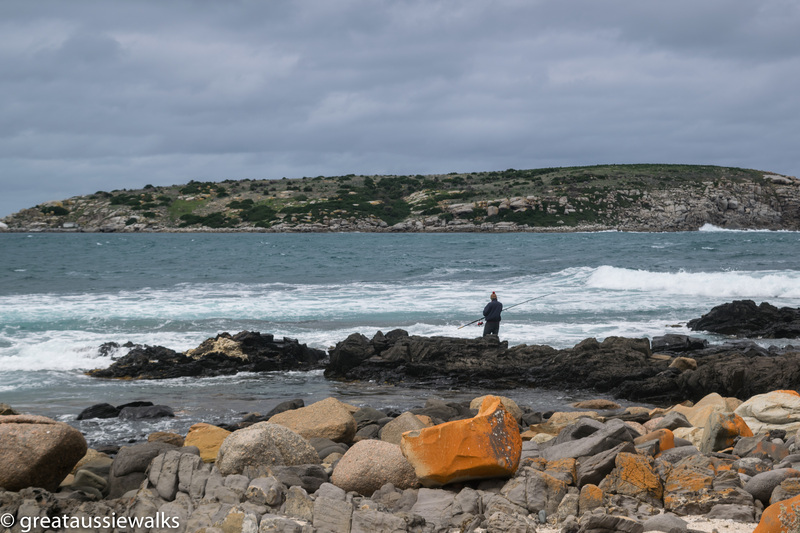 Across the harbor is the uninhabited Wright Island named after William Wright, one of the headmen of the South Australian Company Whaling operations in the Victor Harbor area in the 1800s. The one-hectare island, with granite boulders and sandy beaches for landing small boats, was once home to a colony of over 300 penguins. Unfortunately, the penguin colony on Wright Island was declared to be extinct by the Victor Harbour Mayor in January 2013. The trail passes the surf break between Wright Island and the Bluff, called Shark Alley, where whalers used to tie the whale carcasses off a rock on Wright Island while the meat was harvested which attracted sharks to the area. Although shark sightings are rare in recent times, the name still prevails. An interesting collection of eateries situated along the Franklin Parade, provide culinary alternatives to suit any appetite and a relaxing, scenic place to watch the sun set over Wright Island. The Beach House café, serving a delicious selection of wood oven pizzas and curries, with gluten free options, is a very popular hub, with live music on selected evenings. The Beach House Café is closed on Mondays and very busy on other days, a booking for would be advisable. Next door, Pa's Place is a licensed seafood café with 50s diner appearance. Serving a variety of tasty seafood dishes, deserts and coffee, it is also a popular alternative to driving into Victor Harbor. The Yilki store, has a selection of burgers and meals, ice creams, coffee and an assortment provisions for locals and travellers. Kent Reserve, with picnic facilities, playgrounds for children and gym equipment grown ups, marks the end of the Heritage walking trail. 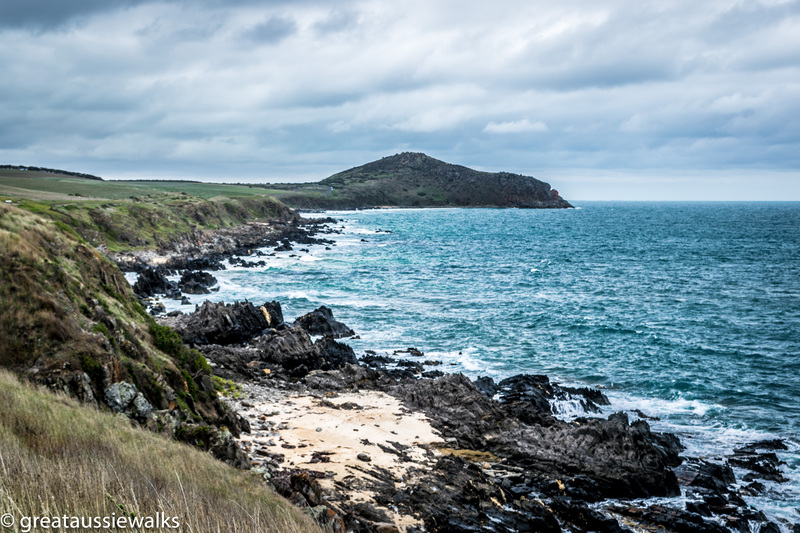 For those with the energy and inclination, the path continues through to Victor Harbor, passing by the causeway to Granite Island. The Heritage Trail has something for all the family with signs along the trail intended to foster an understanding of the cultural, environmental and historical aspects of the region. Toilets are situated at Kent Reserve and on Franklin Parade near the intersection with Whalers Road. Car parking is available at Kings Head Road, Kent Reserve and near the Bluff Jetty. Allow about 11/2 -2 hours one way, allowing extra time if walking with children. Dogs on a lead are allowed on the trail. Excellent article and photos.One of my favourite areas in S.A.Never been to Wright Is.Perhaps one can take boat trips there now?Happy Easter.